The Biology of Australian Weeds. 38. Lonicera japonica Thunb. A wedge shaped bluff plate air-assisted sprayer: III. High-speed, low volume herbicide spraying in dryland field cropping systems. Effect of dry heat on germination and viability of Cryptostegia grandiflora seeds. Control of Mimosa pigra by Phloeospora mimosae-pigrae: liquid culture production and application technique. Can some Australian plants be invasive? Effects of the native environmental weed Pittosporum undulatum Vent. (sweet pittosporum) on plant biodiversity. Transcontinental invasions of vascular plants in Australia, an example of natives from south-west Western Australia weedy in Victoria. Australian plants as weeds in Victoria. NGIA initiatives in environmental weed management. Native plants as environmental weeds on the Mornington Peninsula. 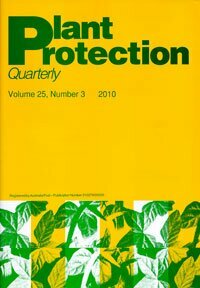 Biological control of weedy native plants in Australia. A challenge for our values: Australian plants as weeds.